So, the other day I was in the Physical Therapy waiting room…waiting for my hubby to get done with his PT, and I struck up a conversation with two ladies. 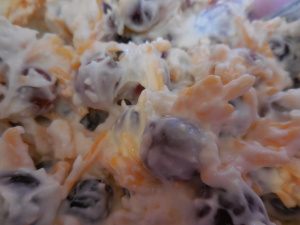 Somehow, we got on the subject of recipes and one of the ladies told me about her famous Grape Salad. She said she makes it so often her husband is tired of eating it! It sounded so tasty, I asked her what all was in it and she rattled off this recipe which was really easy to remember! 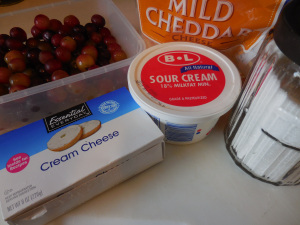 Mix this all together, I used my electric mixer so it would get really incorporated. She uses a variety of grapes, red/green/black seedless. Wash the grapes and be sure to dry them really well with a paper towel before adding the dressing!! You don’t want any water in this! And here is the part I thought was interesting…1 cup of shredded cheddar cheese! Mix everything together and serve. I would chill it, but tonight for supper, I made it and served it right up! It’s like a salad and dessert all in one! Hope you will give it a try! If you do, I would love to hear back from you! This would be so pretty for Christmas using a variety of grapes, red, green, black! I wouldn’t hesitate to throw in some maraschino cherries!